Post your guesses in the comments. Also, Erin looks like Rosalie just ate her baby. I love it too! Love! You guys are going to see NKOTB again? I can't tell if you are happy (because of the capyion,) or mad/pissed (the facial expressions) hmmmmmmm,this is tough! ha! that almost works heatheryruth, except Erin would look excited for that! Grimm, I would say we are of somewhat mixed emotions. Darn it! I thought I had it! Although true about Erin...missed that one! Hmmm...I think maybe you guys are reacting to going to see New Moon when it comes out!? Or wait...maybe you all got together and someone (Jes maybe) said "hey lets watch Twilight on DVD!" and the rest of you reacted with the various expressions! I like the way you think! But it still doesn't work.. Erin Kari and Jes are all Twi-lovers. Me, Corinne and Ryah are the cynics. 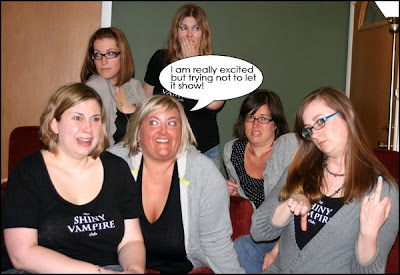 Ok... based on the Rosalie eating babies comment is it about you (or your babies) being turned to Vamps? Or yet another guess....Reactions to some of the casting decisions for NM? I'm still clueless unless it's something like meeting Robb, but then I think it would be different. Kari is to the left of Alison, with her hand to her mouth. I guess we will have to keep giving clues this week! God, it looks like somebody's having a seizure and none of you know what to do. Some of you are all creeped out but then the others can't help but stare ... Oh, but then thr caption wouldn't make much sense, huh? No, that's not an actual guess. Jess looks like she just passed gas and the rest of you think it's gross! Ahh, someone was SO CLOSE. Well can't you let us know WHO so we know what to go on?! I'm gonna go with the casting of Caius! I would say that Peacey is the closest in her reasoning... haha, this is fun! Ok, so in the first post it said it was Twilight related....I don't really get how someone having a seziure and everyone else not knowing what to do is Twi-related, So I'll go with Erin is being turned and no one knows what to do! Think about the SVC and what we blog about. ps. i think we would be excited for someone turning! Well we blog mostly about Twilight stuff, but other books we enjoy as well! Is Jes Imprinting on Finn and everyone else is reacting to that?! Ha! No, Finn and I imprinted last July- he shared his cookie with me and that rest was histroy! no Grimm, but that would totally work! And I'd be thinking "damn, Madonna, put on some pants for once!"